Walking onto the bridge of the Atlantis at midnight may be a bit overwhelming at first, particularly if you have not visited during the day or the giant cup of coffee you drink prior to your journey hasn’t taken effect yet. The space is dark and you are liable to run into just about everything if you don’t wait five minutes to allow your eyes to adjust to the lack of light. Once your eyes adjust, shapes of chart tables, engine panels, and the captain’s chair (which I am known for frequently running into) show themselves in dim and now-avoidable outlines. Welcome to the bridge, a place not many frequent apart from the deck crew and the chief scientist, and the occasional visitor who may or may not be lost. 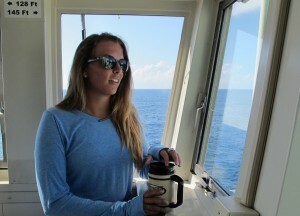 Second mate Max Kantor keeps an eye on deck operations during her morning watch. 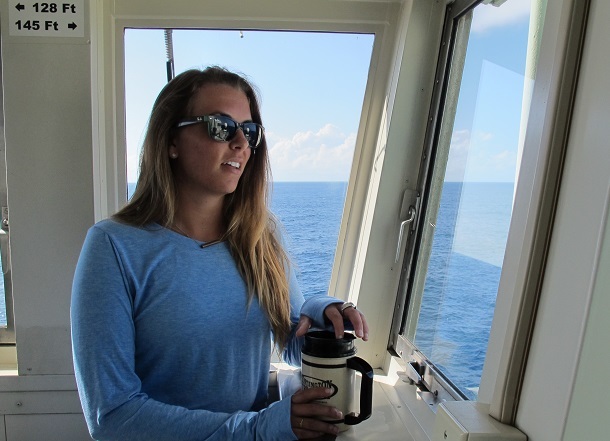 Generally the ship’s crew works behind the scenes to make a science cruise run smoothly and efficiently. Most people know that Captain Colburn is in charge of the vessel: his is the voice in the sky that comes on and off the radio during Alvin launches and recoveries. But what about the other hours of the day? That’s where the deck officers and able-bodied seamen come in. Apart from the captain’s position, the Atlantis has three licensed officers who are each responsible for different tasks aboard the vessel. The Chief Mate oversees the deck department, the Second Mate (me) is responsible for navigational work and equipment, and the Third Mate maintains the safety and emergency equipment aboard. 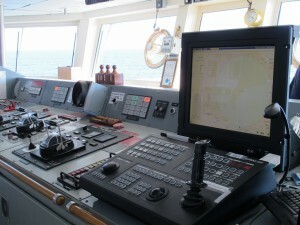 During any given time under way, there will be a deck officer on the bridge in charge of “the watch,” accompanied by an able-bodied seaman to assist him or her. 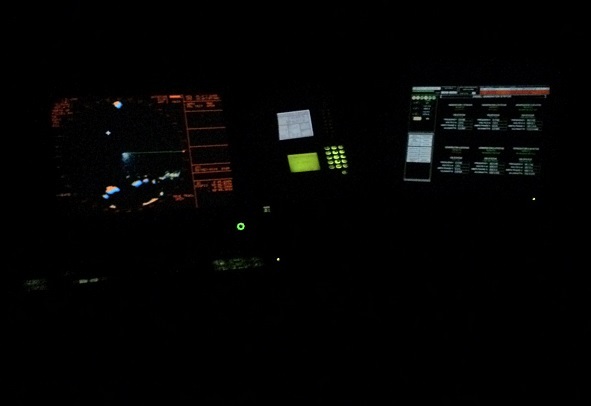 In conjunction with our counterparts in the engine room, we drive the vessel to different science stations, keep a lookout for traffic (or sometimes fouled sea turtles), make sure we are ready for instrument or Alvin launches and recoveries, and generally maintain a safe working environment for the vessel at all times. We aim to keep our shipmates safe and sound, 24 hours a day. So what does the bridge look like? When members of the science party wander onto the bridge, we often hear it looks like a spaceship. As I am not an astronaut and have never been aboard a space ship, I cannot confirm or deny this statement, but I understand why someone might suggest this. There are panels and buttons everywhere, and unfamiliar instruments most people see only in movies. The next question I always get is: Where is the steering wheel? 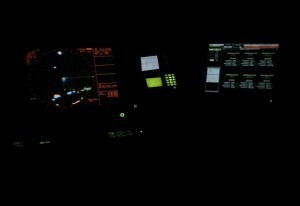 (The helm in nautical terminology.) The answer is, the Atlantis doesn’t have one! The vessel is actually steered by turning the ship’s drives (thrusters) and increasing the number of RPMs (rotations per minute) in the direction we want to go. The Atlantis has three thrusters: two stern and one bow. We can move the ship by moving thrusters individually or by tying the three thrusters together into an integrated system known as joystick mode (like Atari or other old fashioned video games) or in an autopilot setting. 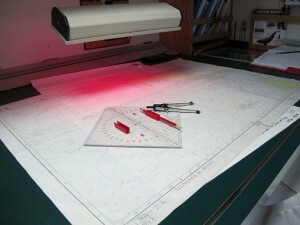 The Atlantis is capable of what is known as dynamic positioning (DP). DP allows the ship to move or maintain position within meters of our target at very slow speeds. It also will hold the ship in an exact position and adjust thruster direction and RPMs to counter any wind or current that would otherwise move the ship. All these steering options make the Atlantis highly maneuverable, which is essential for deploying and recovering instruments like the CTD rosette, the Vent-SID, the Large Volume Pump, and of course, Alvin. Other things you will find on the bridge include the radars, which use radio waves to detect traffic and land around the vessel; an electronic chart system (similar to MapQuest but for ships); and a Global Positioning System (GPS), telling us where the vessel is at any given time. The Atlantis uses paper charts (large ocean maps) for official navigation purposes, and as the second mate I am responsible for plotting our voyage plans and science stations on these charts. instruments and the vessel to different spots on the globe to establish data and samples for a number of scientific missions and goals. 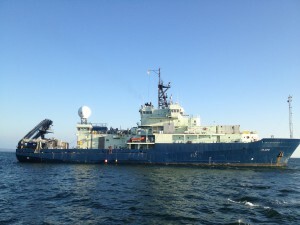 The deck and engine departments attempt to work seamlessly to put the ship where it needs to be daily, so that all the science party needs to worry about—apart from those lucky few who are assigned to night operations like myself—is rolling out of bed after a peaceful night’s rest for Alvin dive prep. And if that is too deluded a dream for our scientists (who tend to work around the clock whilst aboard), I will have fresh coffee available for all at 06:00, when my day is almost over and the waking world is beginning to stir. 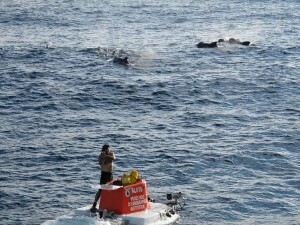 Pilot whales kept an eye on Alvin as Bruce Strickrott rode the sub during yesterday’s recovery. 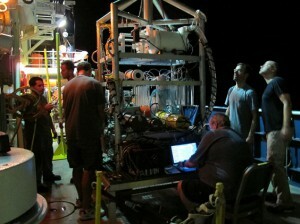 The science team and the Alvin group prepped the Vent-SID for its deployment last night. 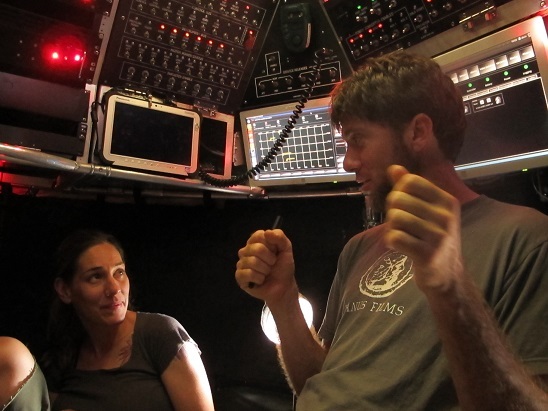 Craig Taylor (seated) sends the last commands to the instrument before it’s being sent to the seafloor. We’ve kept up a busy pace of dives over the past few days. Yesterday’s recovery was even more spectacular to watch than usual: A pod of pilot whales stopped by to check out Atlantis and Alvin as the sub came up. The three divers inside—pilot-in-training Jefferson Grau, pilot Phil Forte, and research associate Sean Sylva—could hear our visitors but weren’t able to see them. 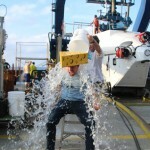 The trio came aboard with several more vent fluid samples and tube worms for the science team. Yesterday also brought the second deployment of the Vent-SID microbial incubation tool. After some testing and debugging on deck, the platform went over the side again last night. It should be collecting and incubating microbes now. We’re looking forward to its arrival at the surface tomorrow afternoon to see what it brings back. 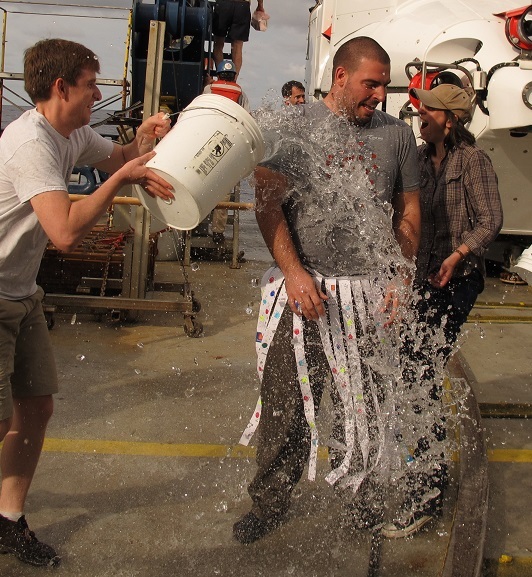 We promised you more ice-bucket action, and now it’s time to make good on that: On Monday, marine biologist Horst Felbeck, postdoctoral researcher Donato Giovannelli, and pilot Bruce Strickrott dove to the bottom, where they deployed microbial colonizers and collected tube worms, vent fluids, and two nice chunks of basalt (volcanic rock). 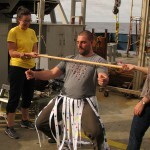 Newbie diver Donato, easily recognized around the ship by his imposing frame, was welcomed back with a limbo stick. 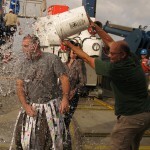 When he could no longer make it underneath, he got his ice-water shower. 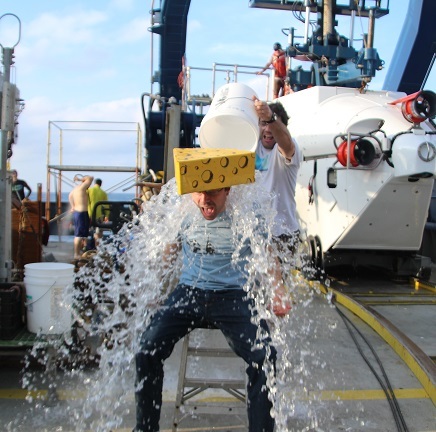 Chief scientist Stefan Sievert delivered the first blow, and grad student Jesse McNichol (a freshly initiated Alvin diver himself) finished the job. 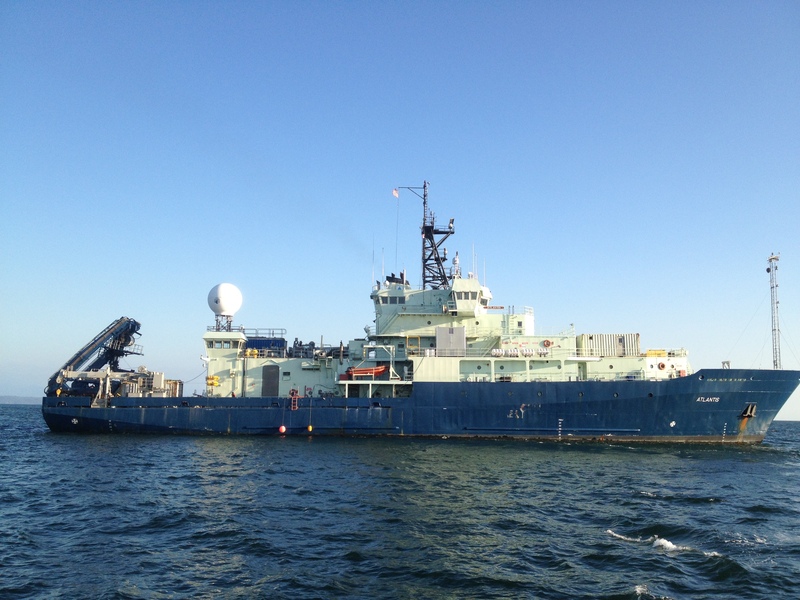 During today’s Alvin dive, pilot Bob Waters, geochemist Jeff Seewald, and microbiologist Fengping Wang descended to the seafloor. 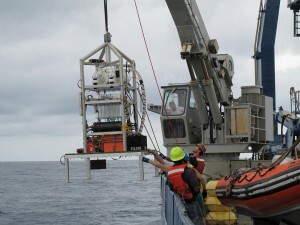 Their first task was to find a new research tool called the Vent-SID, which had been deployed to the bottom for the first time on Friday, and send it back up to the ship. 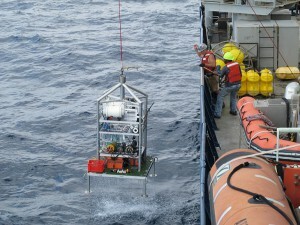 The Vent-SID collects samples of microbes that live in vent fluids. Eventually, the scientists on board hope to use it to incubate microbes in their natural environment on the seafloor and study their activity levels. 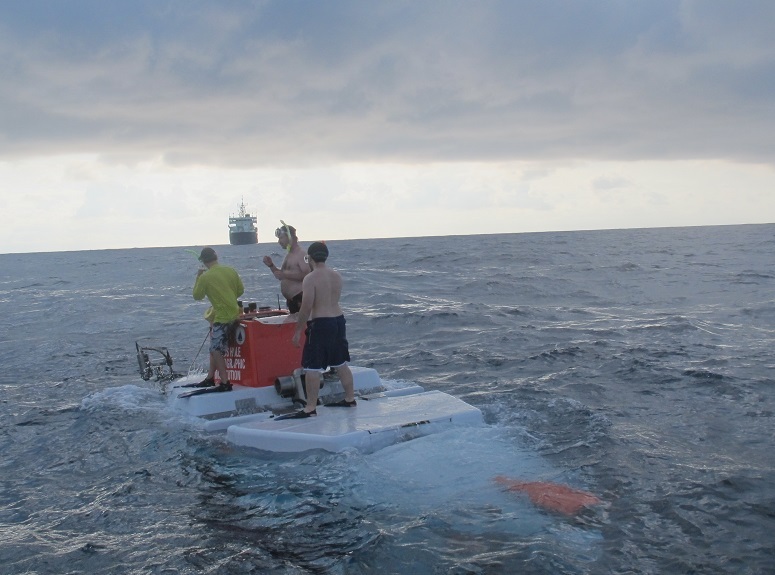 When the instrument reached the surface a little after noon today, the deck crew brought it aboard. Stefan Sievert, Craig Taylor, Jeremy Rich, and Nuria Fernandez Gonzalez were on hand to meet it and have a look inside, along with some of their students and collaborators. The Vent-SID successfully collected and preserved samples of the microbial communities at the vent where it was stationed, so the researchers will analyze those. The incubation part of the test-run was interrupted, so the team will review the system’s activity log and possibly make a few tweaks before the Vent-SID’s next deployment a few days from now. 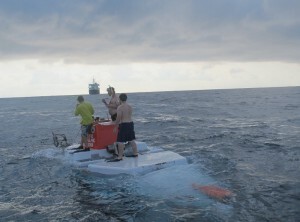 Alvin recovery swimmers Phil Santos, Peter Leonard, and Logan Driscoll meet the sub as it surfaces. Atlantis can be seen in the distance. After yesterday’s maintenance work, Alvin was back in the water for a fantastic dive today. 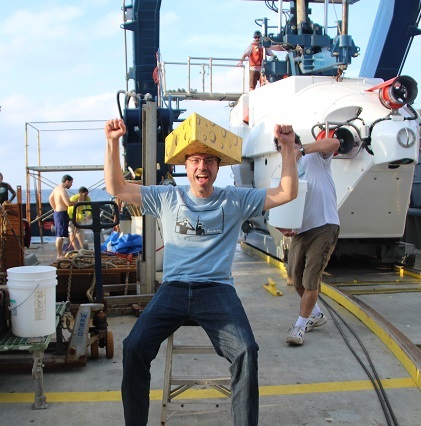 Pilot Phil Forte, microbiologist Craig Taylor, and microbial biogeochemist Jeremy Rich traveled down to the vents. The trio located the Vent-SID on the bottom, moved it to the site that had been scouted out on a previous dive, and triggered the start of microbe sampling and incubation in the Vent-SID’s chambers. They also brought back a beautiful chunk of vent chimney covered in Alvinella worms and gathered mussels for analysis of microbial biofilms on the animals’ shells and symbiotic microbes living in their gills. 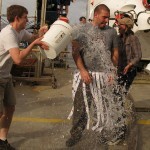 As the sub surfaced, I tagged along with a team of swimmers riding out to meet it in a Zodiac launched from the ship. We skimmed across the water (a bumpy ride even on a relatively calm day) and watched as Alvin broke the surface. The A-frame on Atlantis lifts Alvin from the water. 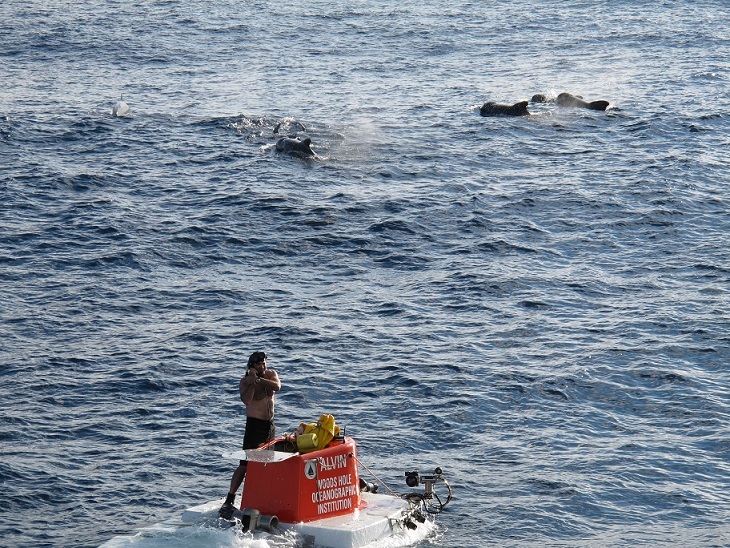 The swimmers hopped into the ocean and began prepping the sub for recovery. They attached a safety line to the science basket, so that if the recovery got rough, the day’s samples wouldn’t be lost. As Alvin approached the ship’s stern, they put out a sea anchor to help stabilize it, communicated with the pilot to help him get the sub into position, and attached the two lines that lift Alvin out of the water. 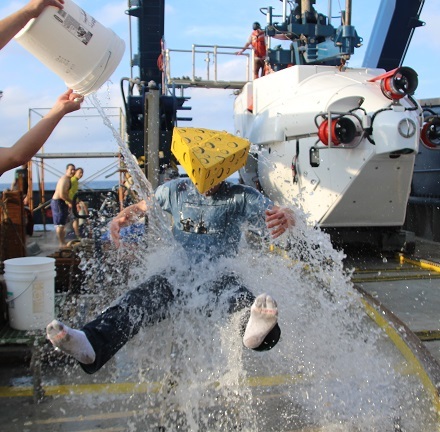 Once the sub was back aboard, first-time Alvin diver (and native Wisconsinite) Jeremy received his ceremonial buckets of ice water wearing headgear specially prepared for the occasion by some of his shipmates. Alvin techs Logan Driscoll (left) and Jefferson Grau work on the sub’s variable ballast system. Our rainy weather continues here in the eastern Pacific, and Alvin stayed aboard the Atlantis for some maintenance today. As the Alvin team inspected the sub this morning, they discovered an O-ring in need of replacement in a valve for the variable ballast system, which helps fine-tune Alvin‘s buoyancy. 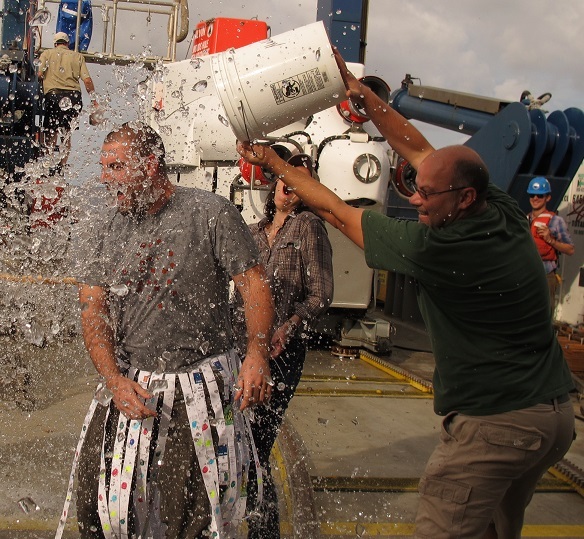 To get the job done, the Alvin team released the water and pressurized air from the system so the valve could be removed. Tech and pilot-in-training Jefferson Grau took on the job of replacing the O-ring and testing the valve to get it back online. 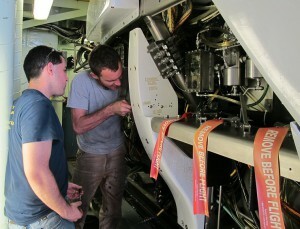 Then the team refilled and repressurized the system and checked it for leaks to get the sub ready for action tomorrow. 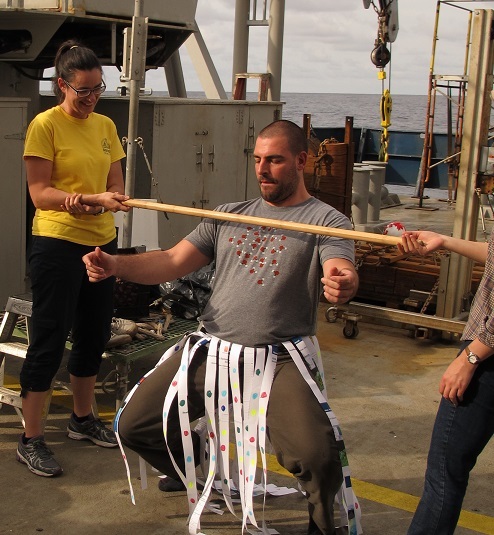 While Alvin was being worked on, the science team had a chance to regroup after the two big batches of samples they received from the earlier dives. Some took advantage of the day to get caught up on their sample processing. Happily, there was also some time to set up and test out the ping pong table in the main lab. News from other corners of Atlantis: A few days ago, the ship’s dishwasher stopped working. With their usual grace under pressure, the stellar team in the galley (Carl Wood, Brendon Todd, and Janusz Mlynarski) continued to treat us all to amazing fare despite the hardship. And yesterday, our ace engineering department got the dishwasher up and running again. From everyone on board, thanks to all of you! Atlantis deck crew members deploy the Vent-SID for the first time ever. After Alvin‘s successful first dive of the trip yesterday, today brought the first deployment ever of a brand new robotic tool called the Vent-SID. 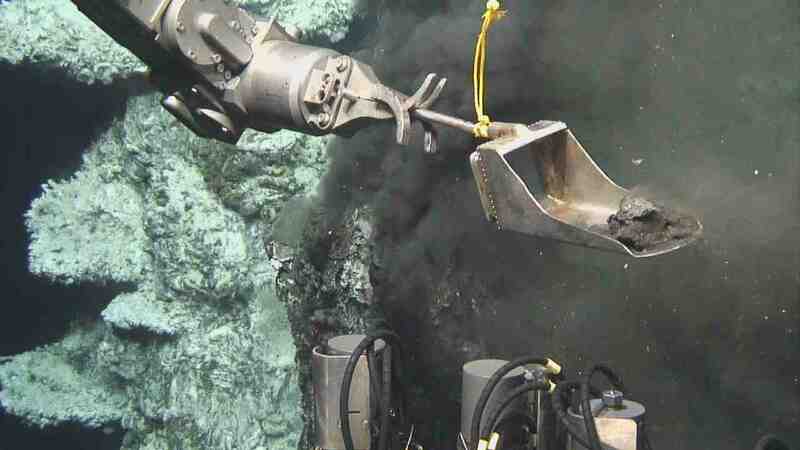 It will allow scientists on board to determine the metabolic activity of microbes—such as how quickly they use up certain substances—in their natural environment on the seafloor. The Vent-SID is on its way to the bottom now. During Alvin‘s next dive, the sub will locate the Vent-SID on the seafloor, move it into position, and trigger the start of sampling. Since the tool has never been used at sea before, we’re eager to find out how its first test-run goes. Alvin made another productive dive today, with pilot Bruce Strickrott, microbiologist Katie Scott, and pilot-in-training Jefferson Grau. They collected more vent fluids and tube worms. 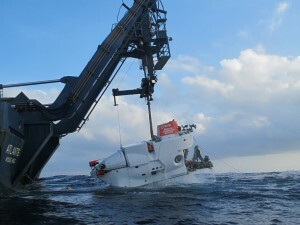 While Alvin and its crew were on the bottom, the science team met to review yesterday’s dive. Stefan Sievert presented images of the site where the Vent-SID will take samples, the spot where giant tube worms were collected, and the black smoker from which chimney samples were taken. Today’s dive went smoothly despite some squally weather that dumped rain on the Atlantis throughout the day. 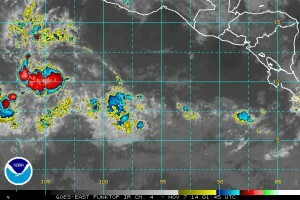 The captain shared a satellite image of the culprit: tropical weather system Invest 96E. 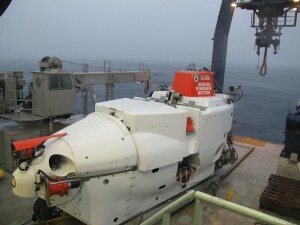 But the Alvin recovery team worked gamely through the rain and got the sub back aboard safely. To keep the crew and the sub’s sensitive electronics dry, Alvin backed into its hangar with the hatch closed. Alvin backs into its hangar after a successful recovery in the rain. Graduate student Jessica Panzarino gets a briefing from pilot-in-training Chris Lathan inside Alvin‘s sphere. We expect to reach the vents early tomorrow morning, so everyone has been gearing up for our arrival. At an all-hands science meeting yesterday, chief scientist Stefan Sievert and the other principal investigators discussed the expedition’s research goals and how to get the samples and data they need to achieve them. One big focus will be understanding the activity of microbes that live beneath the seafloor and in the fluids emanating from the vents. “We know pretty well who’s there,” Stefan says of the microbial community at the vents, “but we lack an understanding of how active they are.” An innovative new tool called the Vent-SID that will be deployed for the first time ever on this cruise will help him and his colleagues find out. Meanwhile, the Alvin team has been getting the sub ready for its first dive. They’ve also been preparing all potential divers on board with a briefing on what to expect inside the personnel sphere and an explanation of the sub’s safety features. Anticipating a possible dive tomorrow morning, expedition leader and pilot Bob Waters met this evening with the first pair of scientific observers, Stefan and graduate student Jesse McNichol, to review the dive plan. With a little luck, they’ll be on their way to the bottom to explore the vents just a few hours from now. 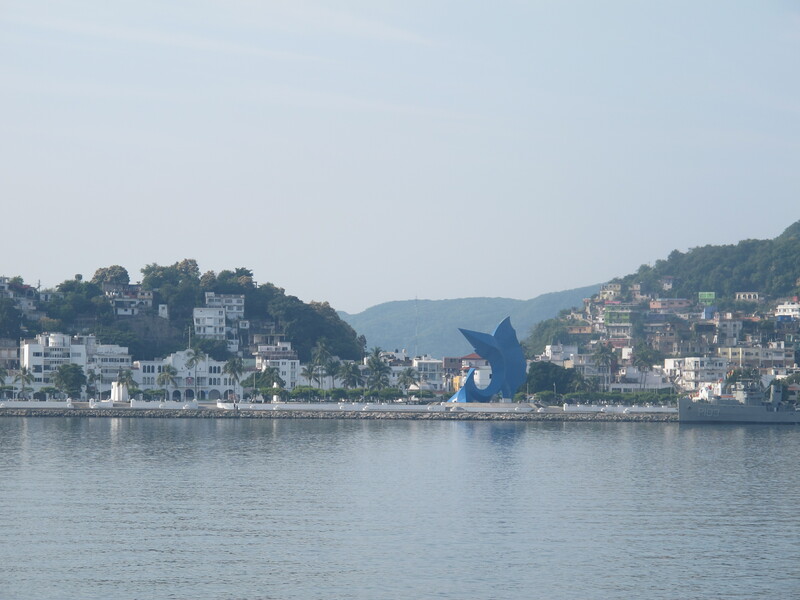 We pushed off from Manzanillo right on schedule this morning, at around 9 a.m., and began our transit south. 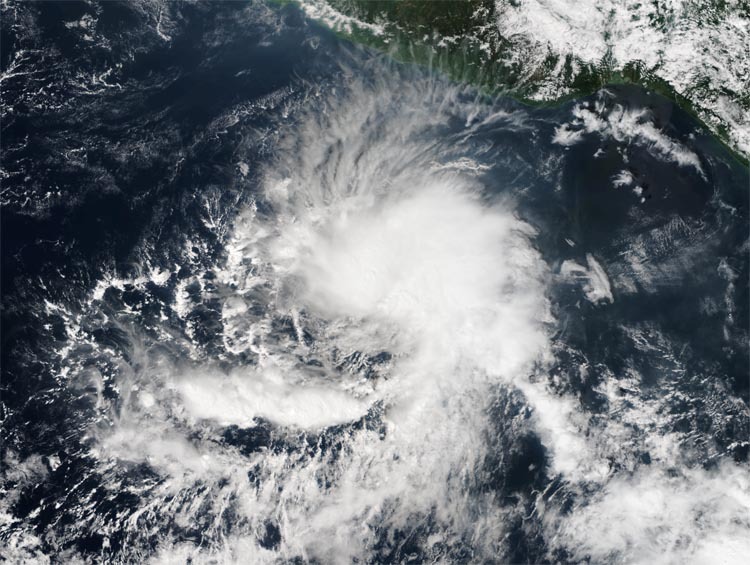 The storm in the eastern Pacific has strengthened into a hurricane, but the captain reports that it seems to be moving along its predicted path away from our study area. As of today, it’s expected to be at least 250 miles away by the time we reach the field site a few days from now. 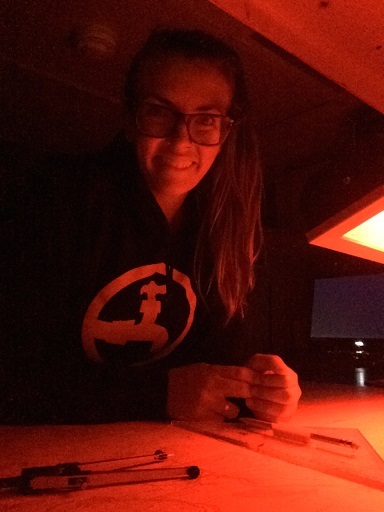 After setting up the labs and berths on the ship while in port, we’re happy to be under way. This morning, the science team received safety training and mustered for fire and boat drills. We also got our first briefing from Alvin expedition leader Bob Waters, who explained the sub’s life support and camera systems. Everyone is looking forward to the first dive later this week. 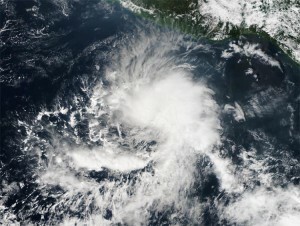 Tropical storm Vance in the East Pacific (photo by NOAA visualization lab). Hi from Manzanillo. By now most scientists have arrived from a variety of destinations around the world. We are now busy unpacking boxes with equipment and supplies, and setting up the labs on Atlantis, our home for the next few weeks. We have all made detailed plans of what we are going to accomplish on our expedition, but when you go to sea you always have to be prepared to face some adversary. Today we learned that there is a tropical storm in the East Pacific that is predicted to develop into a hurricane, and that currently slowly moves towards our field site. We hope that it will have passed the field site by the time we arrive there, but still the storm will affect the sea state on our transit to the field site, and might even delay our departure from Manzanillo. So, stay tuned for further updates. Right now we are all still at home, doing some last minute work to get ready for the cruise. Soon, we will all meet in the city of Manzanillo on the west coast of Mexico, where the research vessel Atlantis will await us. Starting on November 2, we will embark on an almost 1-month long research expedition to explore exotic life at the depth of the ocean. Being on a cruise is exciting, as it represents the culmination of a lot of hard work in preparing for it. We are all eagerly awaiting the start of the cruise. We will post about the cruise as often as we can, to keep you all informed. So, stay tuned for the next update from Manzanillo.